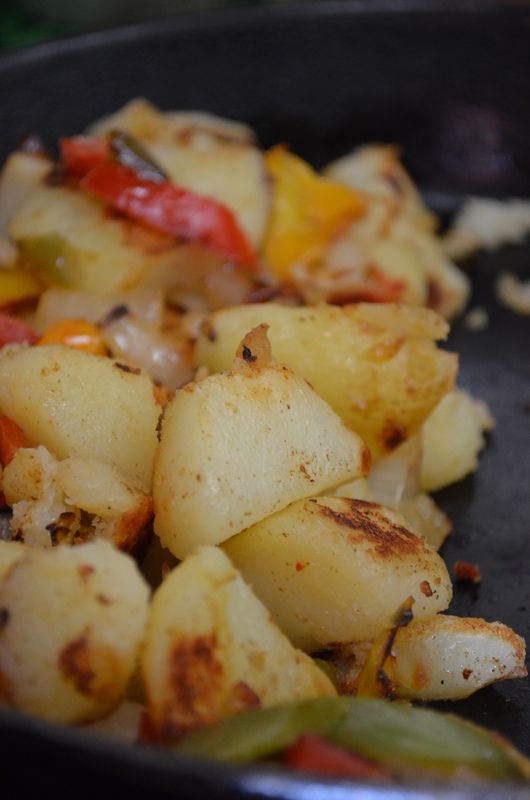 I rather figured that everyone in the US knew how to cook home fries, and felt that putting them on the blog was daft of me, despite the fact that they’re normally gluten free, and my kids love them. However, it would appear that I am wrong. An American friend of mine just asked for my recipe for them, and my daughter said she needed a recipe for when she left home (and yes, this is a repository of recipes for my girls), and they’re not so common in England anyway, so perhaps a recipe is needed! For the Brits: these are like mini, pan-fried, roast potatoes. Lightly browned breakfast potatoes (homefries). It’s easy to crisp them up further, but my daughter likes them a little softer. Note: In my opinion, this is easiest to make if the surfaces of the potatoes are dry before they are fried. I will usually cook them as jacket/baked potatoes in the oven/microwave, then peel and cut into cubes before frying. Make sure the fat is good and hot before adding the potatoes in order to avoid having the potatoes soak up too much of it. Another option is to peel and dice the potatoes, then simmer in salted water until just cooked, then drain and allow to cool slightly (and dry) before continuing to fry them. Obviously, left over potatoes work well here. I did try cooking the potatoes from scratch with the onions and peppers, but the onions/peppers had a tendency to burn if cooked before as well as with the potatoes, or didn’t brown at all if added after the potatoes had crowded the pan. Oh, and as an aside: if you ever find you have left overs, these are excellent thrown into creamy broccoli soup as lumpy bits after the soup has been blended. Warm the first half of the fat in a large frying pan. Cook the onion and red/orange/yellow pepper strips in the fat until they’re soft and starting to brown. Remove from the pan, and put to one side. Add the remainder of the fat to the pan, and once it is hot, add the potatoes. Keep them moving around with a metal spatula/fish slice, to reduce sticking, scraping the bottom of the pan as necessary (those crispy bits are tasty, but also stop the potato cubes from browning further, if not scraped off). Fry until they start to brown on all sides (this will be quite quick, if the surface of the potatoes is dry and the fat is hot). Add the onion and peppers back into the hot pan to reheat, sprinkle salt and pepper (and paprika or cayenne pepper, if liked) over the vegetables, and serve hot for breakfast, with scrambled tofu and some ranchero sauce (for example). This is a Sunday morning special, easily used for entertaining as all parts of this dish can be made in advance, and just reheated and put together when you’re ready for it. The bread is delightfully chewy, contrasting well with the soft, creamy spinach making this a very (physically and mentally) satisfying breakfast. There’s something very liberating about feeling ‘normal’, and I got that feeling from this breakfast. Traditional hollandaise sauce is made predominantly from eggs and huge amounts of butter. Even if I wanted to just substitute vegan margarine for the butter, my tummy couldn’t cope with the quantity of fat called for. My head can’t quite get around the number of calories involved, either. My version isn’t exactly diet-worthy, it is an indulgence, but not one that you’ll be paying for 3 days later! For an even less calorific weekday version, just omit the bread. 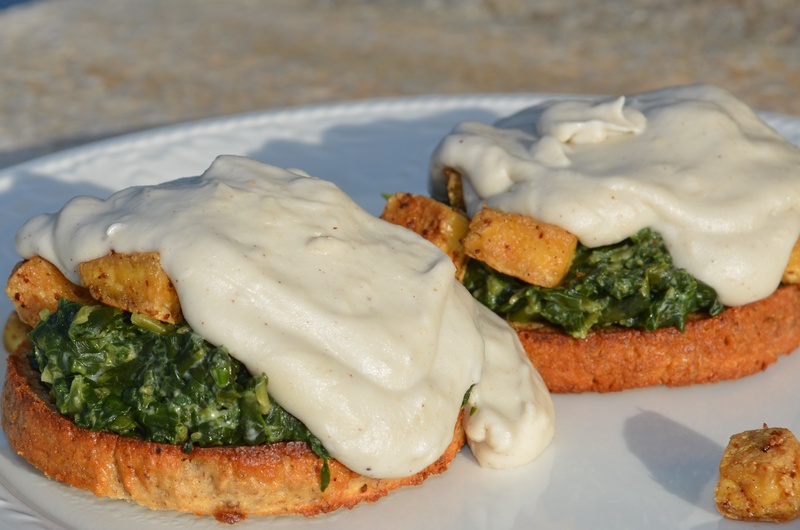 Tofu Florentine in the dawn sunlight. I made this one without the sweet corn in the spinach, as the Hollandaise sauce provided the counterpoint to the spinach that the corn was used for, and without the carrot coloring. 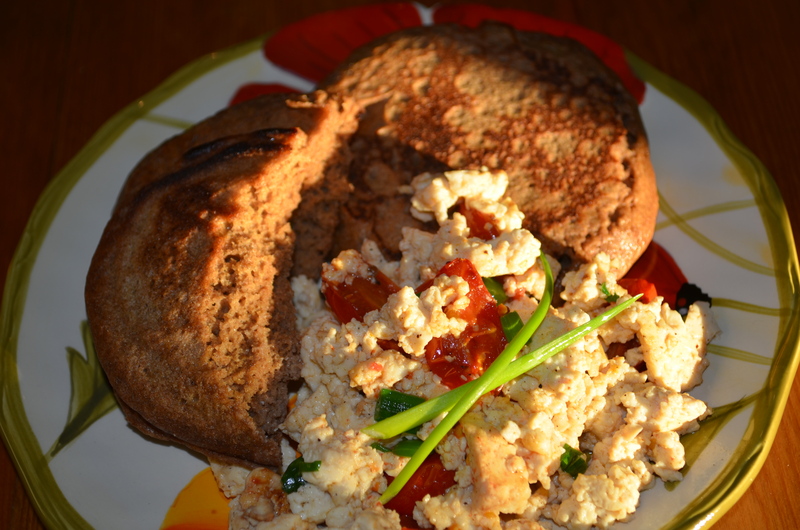 If you’re not avoiding eggs, then you can substitute a fried or poached egg for the tofu. However, the tofu has a delightfully chewy texture which adds body to the dish. Note that the recipe calls for 1 onion layer. You could use a slice, if you wanted to, but I find it easier to remove the onion after it has infused, if there’s only one piece to locate. Note how the small amount of carrot included in the hollandaise sauce changes it to a rich, buttery/eggy color. Put all the ingredients in a saucepan, and bring to a gentle simmer, cooking for 10 minutes to allow the flavors to infuse. Remove the bay leaf and onion, transfer the rest to a blender, and blend until smooth. Pour the blended sauce back into the saucepan, and bring to a simmer to thicken to desired consistency and cook off the harsh part of the vinegar flavor, stirring frequently (5-10 mins). Adjust consistency with water if necessary. This sauce should be a thick, pourable, cream. Thin enough to flow, but thick enough to coat. First, make sure the surface of your tofu is as dry as you can get it (to stop it from sticking to the pan): leave the drained cubes uncovered in the fridge overnight OR put them on 2 layers of kitchen paper towel wrapped in a cloth kitchen towel for 1/2 an hour. Sprinkle the seasonings over the tofu, adjust as necessary, and turn off the heat. Make sure the spinach, tofu, and hollandaise sauce are all hot. Toast the bagel bread slices in a toaster. 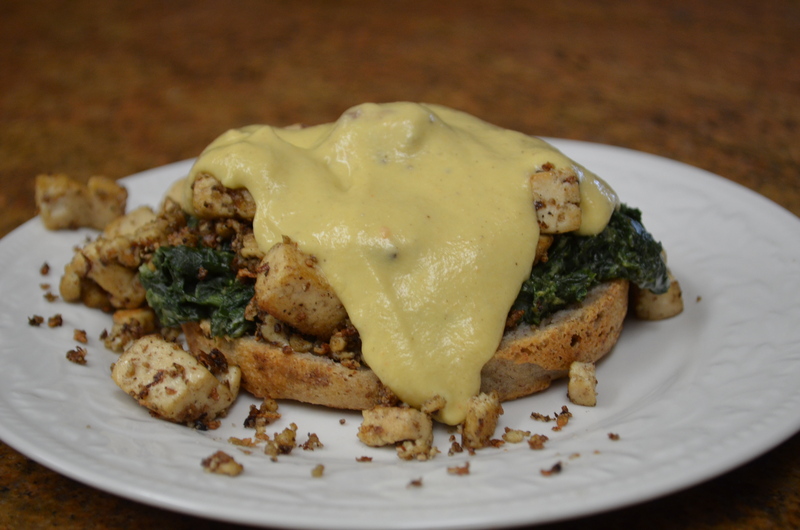 Top each slice with spinach, a handful of tofu, and then spoon the hollandaise sauce over the top. Breakfast has proved to be a rather difficult meal for me, since I gave up wheat. I did a search for gluten free breakfasts on-line, and was treated to a list of high calorie foods utilizing large amounts of starch. I don’t care for the commercial GF cereals on the market, as so far they’ve proved to be too sweet, lacking in substance and nutritional virtue, or too high in calories. Muffins are a decadence to be had with afternoon tea (and I prefer savory stuff anyway), and I suspect that I don’t get on with oats, so oatmeal/porridge is out of the question (though I am experimenting with quinoa porridge). I like tofu (especially scrambled tofu), but I don’t want that every day, and I would blow up like a balloon, if I were to indulge in tofu rancheros every day. I like baked beans on toasted almond bread, and I like this spinach. I don’t stop at breakfast with this, though. I also like it on its own for lunch, or stuffed into galettes or baked potatoes, or inside a burrito, or under scrambled tofu, or sometimes even with pasta and a sprinkling of seaweed (yes, I know it sounds weird, but try it)! It’s a comfort food. I’m inclined to say, “nothing fancy here.. Just breakfast for one,” but that would belie just how much I like it. However, if you don’t like spinach, then read no further. It’s rather difficult to eat 8 oz of raw spinach, due to volume, but cooked spinach is another matter, and my 8 oz of spinach gives me about 6 grams of protein and 6 grams of fiber (according to the information on the back of the package) all on its own. This version is warming with the nutmeg and pepper, and spinach’s sometimes harsh edge is tempered with the cream cheez. Heat the sweetcorn and spinach until it has wilted/thawed and given up and evaporated its released liquid. Stir in the other ingredients, and serve as is, or on toasted almond bread. This doesn’t come under the heading of diet food. This is a gratuitous weekend morning celebration of life/family/friends. It does take a bit of forethought, if you’re going to make your own Refried Beans and Ranchero Sauce (highly recommended), but if you double or triple up recipes when you’re making them (and keep them in the freezer), it comes together quickly! 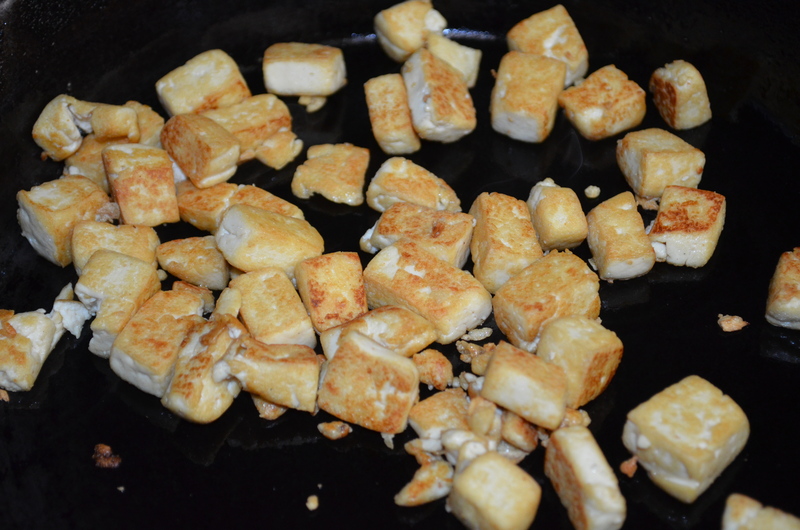 I find that frying the tofu is most easily accomplished when the surface of the tofu is dry, the frying pan is hot (not warm), and the fat used for frying is margarine (I use Earth Balance). For some reason, canola (rapeseed) oil just isn’t up to the job. 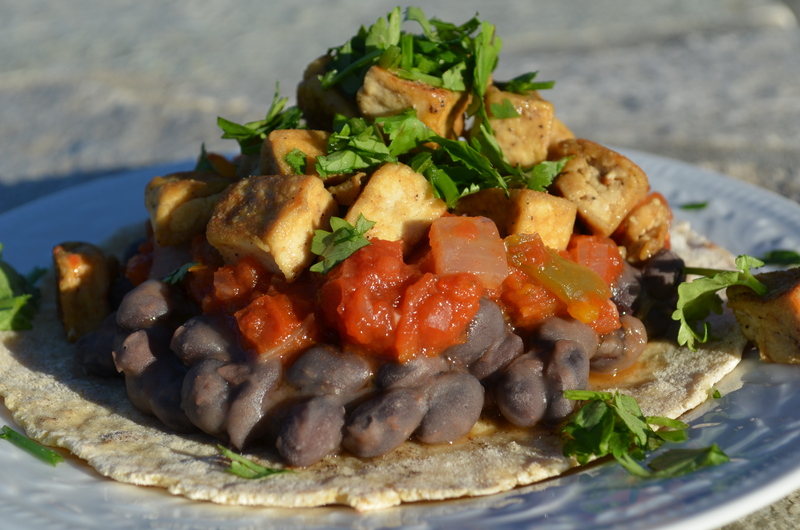 Tofu Rancheros with refried black beans. Drain the tofu, cut it into 1/4” cubes, and wrap in a layer of kitchen paper and then a layer of cloth kitchen towel. Spread the pieces out so they all touch the towel, and leave for at least 1/2 hour so the surfaces can dry. Warm the Rancheros sauce and refried beans in separate saucepans, and warm the tortillas over the Rancheros sauce, in the microwave, or in a warm, dry frying pan. 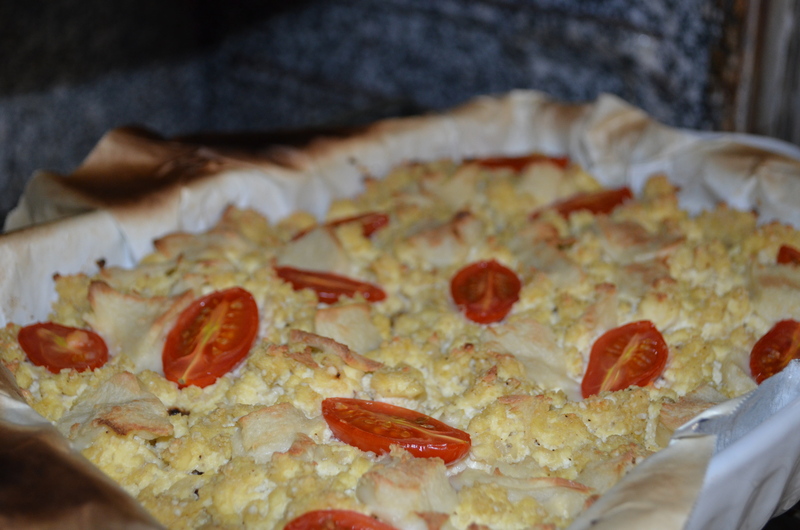 In a small bowl, mix together the nutritional yeast, Braggs, and pepper. In a large frying pan, heat 1/2 the fat over a high heat, and then add 1/2 of the tofu. Keep the tofu moving until it is browned all over (~10 mins), then tip it into the seasonings. Repeat the process with the other 1/2 of the margarine and tofu. Lay one tortilla on each plate. 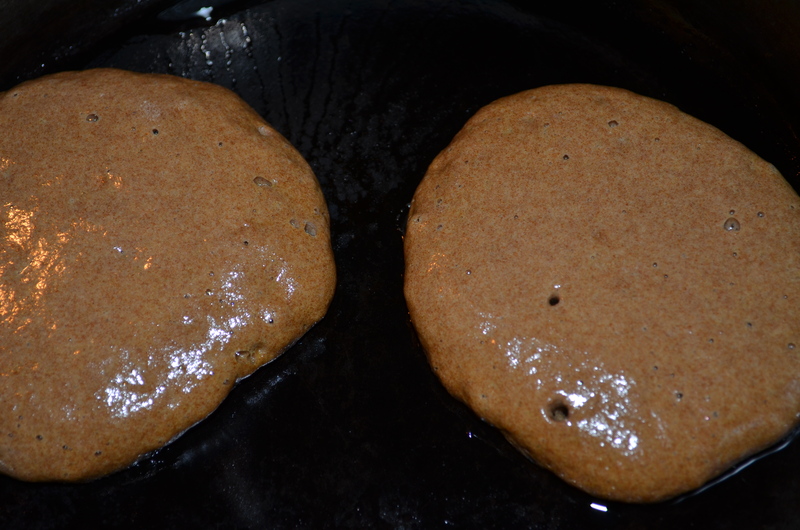 Smooth out 1/4 of the refried beans on top of each tortilla; top this with ranchero sauce and 1/4 of the tofu. Serve immediately, decorated with the fresh cilantro (leaf coriander).